Malik King, CAN-DO Prison Outreach Coordinator, put Katina Smith in touch with CAN-DO Founder, Amy Povah so she could ask if Katina wanted to start a change.org petition for her mother, Minnie Pearl Thomas who is #4 on the CAN-DO Top 25 Women Who Deserve Clemency. Katina agreed it would be a good idea, so we worked with Katina to draft a plea urging the public to help bring Katina’s mom home. 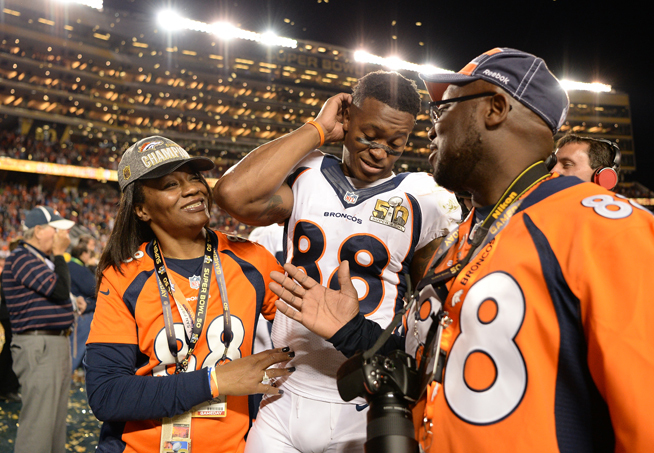 Katina Smith received clemency on July 13th 2015 and was able to attend the Super Bowl and watch her son, Demaryius Thomas, play in Super Bowl 50. The Broncos defeated the Carolina Panthers 24-10, winning their first Super Bowl title since Super Bowl XXXIII. The only thing missing was her mother, Minnie Pearl. We hope President Obama will commute Minnie Pearl Thomas’s sentence, soon. Special thanks to Malik King who communicates with over 200 prisoners and is a great asset to the CAN-DO Foundation and our mission to help bring more people home to their loved ones. On 2/15/2016 the following article came out in the Denver Post about Katina’s petition on change.org. “My mom and I made mistakes by getting involved with drugs,” Smith wrote. 45 queries in 0.157 seconds.